Until recently, The Orleans Parish District Attorney’s Office sent notices like this that threatened jail time if people didn’t come in for questioning. But they weren’t legal documents because they weren’t authorized by a judge. Similar notices, also falsely labeled “subpoena,” were sent by the Jefferson Parish DA’s office. 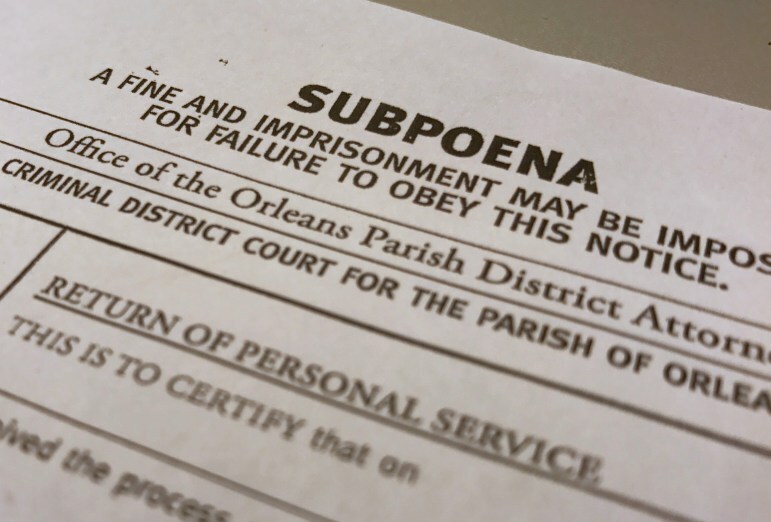 The Southern Poverty Law Center has filed ethics complaints against two New Orleans-area district attorney’s offices for using fake subpoenas to pressure witnesses to talk to them. The complaints, which were filed Thursday with the state agency that oversees attorney discipline, allege that the offices of Orleans Parish District Attorney Leon Cannizzaro and Jefferson Parish District Attorney Paul Connick violated ethical rules for attorneys by sending the notices to witnesses in criminal cases. The Lens revealed Orleans prosecutors’ use of the notices in April. The next day, Connick’s office admitted to using them too, though its notices didn’t threaten fines or jail time like the ones in Orleans Parish. Both district attorneys said they would stop the practice immediately. It’s unclear how long the DA’s offices used fake subpoenas, but Cannizzaro’s spokesman Chris Bowman told The Lens in April he believed it had gone on for decades. The Louisiana Office of Disciplinary Counsel investigates these complaints and can bring cases to the Louisiana Attorney Disciplinary Board. Punishment can include reprimand, suspension of one’s law license, and disbarment. The board can reprimand a lawyer itself; suspension and disbarment are up to the Louisiana Supreme Court. Late Thursday afternoon, The Advocate reported that the Office of Disciplinary Counsel is looking into the matter. Bowman did not immediately respond to a request for comment about the complaint. Paul Purpura, a spokesman for Paul Connick, declined to comment. State law requires prosecutors to ask a judge to issue a subpoena if they want to interview a witness in private. If the judge grants the request, the subpoena is issued by the clerk’s office. Instead, prosecutors in Orleans and Jefferson parishes just sent out their own “DA subpoenas,” as they called them, telling people to show up at their offices for questioning. They had no legal authority to do so. Defense lawyers and legal experts told The Lens the notices were misleading, unethical and perhaps illegal. But Bowman initially defended the practice, saying the notices looked official because people would ignore a letter from the DA requesting an interview. The ethics complaints allege that prosecutors violated a state rule requiring attorneys to be truthful when dealing with third parties such as witnesses and victims, as well as a related rule prohibiting lawyers from misrepresenting themselves to people who don’t have an attorney. The complaints further allege that the DAs themselves violated a rule requiring managers to ensure their subordinates operate in line with attorney ethics rules. “The totality of the District Attorney’s Office’s conduct may amount to a violation of Rule 8.4,” Davidson wrote in the complaints. Along with the state rules, Davidson argued that the use of fake subpoenas violated American Bar Association standards. In the complaint against Cannizzaro’s office, Davidson criticized prosecutors for continuing to send out bogus subpoenas even after a lawyer for a witness in the Cardell Hayes manslaughter case pointed out in November that they were unlawful. The office used fake subpoenas in at least two cases after that. Even after Cannizzaro called the so-called “DA subpoenas” improper and announced his office would no longer use them, he “attempted to downplay the violation by insisting that ‘there are no legal consequences’ if a person failed to respond to the fake subpoena,” Davidson wrote. However, Davidson cited a Lens story that described one case in which prosecutors obtained an arrest warrant for an alleged domestic violence victim in part because she had ignored a fake subpoena. Even in recent years, it’s unclear how often the DAs used fake subpoenas. Cannizzaro denied a public records request from The Lens for all fake subpoenas issued between January 2016 and mid-2017. The Lens is suing Cannizzaro for the records. The ACLU of Louisiana and the MacArthur Justice Center have filed similar suits. Last month, a judge ordered Cannizzaro to disclose the names of prosecutors who used fake subpoenas. Cannizzaro is appealing that order. The DA’s office on the North Shore sent similar notices, though they weren’t called subpoenas. That office, which is not named in today’s ethics complaints, also pledged to stop.